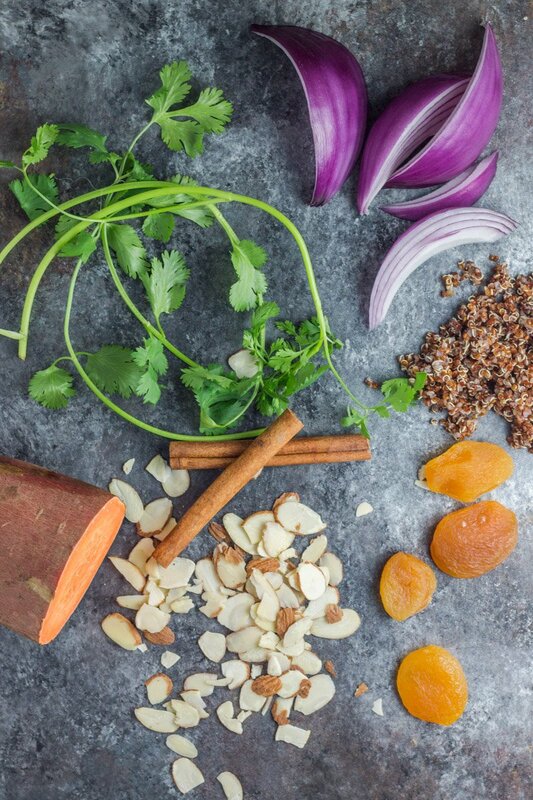 Hot or cold, it doesn’t matter how you devour this sweet potato quinoa Moroccan salad. A delicious plant-based dish with simple ingredients inspired by traditional Moroccan flavors. Serve it as a side or a main dish – and even keeps well for leftovers! A dear friend is also going through this solo-mom journey with me as her husband is also deployed. You see, having a mom friend with small children who’s husband is overseas (ironically in the same country as my husband) is pure gold. No one else truly understands the weight a military momma bears when daddy leaves for a year. No one really gets the ins and outs of every day life – or when non-military friends say, “oh wow, time is going by so fast!” and although you love that friend, you kind of want to punch them in the face. Just kidding, I’d never punch a friend in the face, maybe more like the arm. But you know what I mean…. Ok so maybe I’m feeling a little pent up lately. Running a business, raising two crazy boys, managing the household, and just feeling some insane loneliness during evenings and weekends can really take its toll. That’s why my girlfriend so often suggests we do ‘beach therapy’ on the weekends. Which really means we gather our wolf pack, throw some sand toys at the kids, and decompress (or cry to one another). Did I mention we bring wine? It’s essential. But one much-needed-beach-therapy-day I decided we shall fuel our own mommy bodies with food. Like actual food – not leftover crumbs from the kids or a half-eaten piece of watermelon. 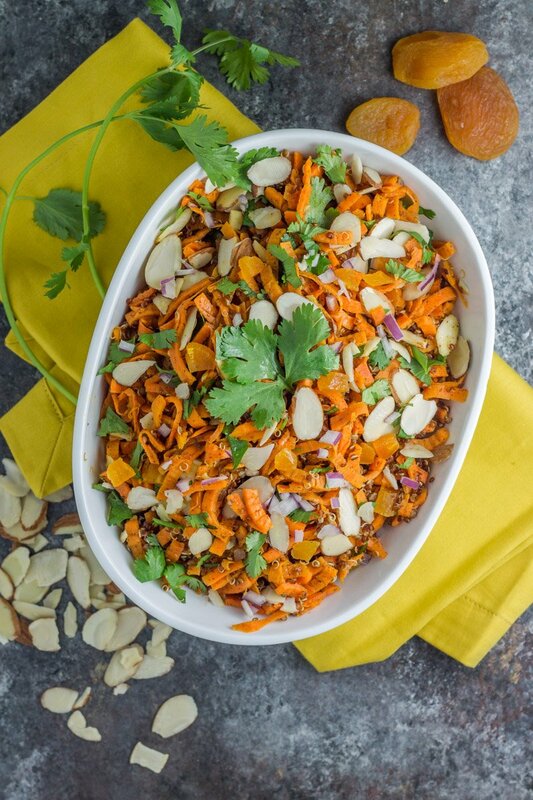 This sweet potato quinoa Moroccan salad was perfect for our much needed beach therapy day, and an absolute essential for your next side dish or picnic contribution. So many textures to delight your senses – spiraled sweet potatoes, quinoa, and almond slivers, combined with dried apricots, cumin, and cinnamon. Add in a little fresh cilantro too – BAM flavor heaven. Therapy for your taste buds and comfort food with REAL food. 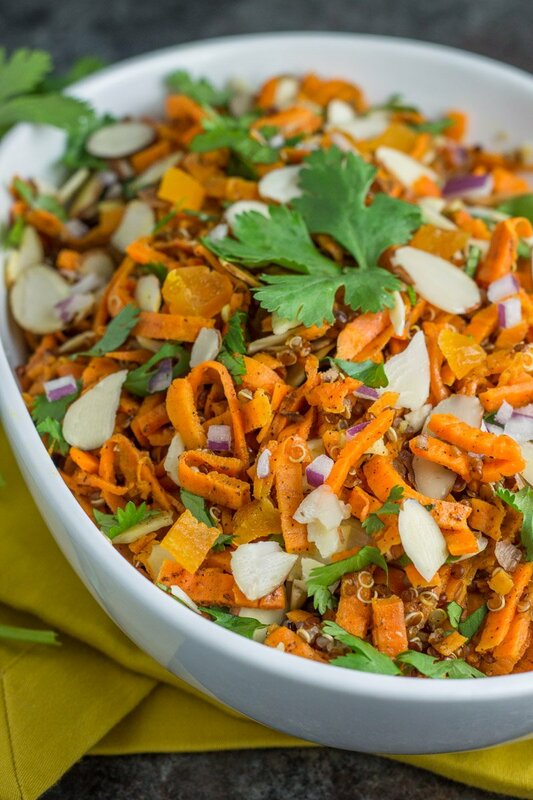 It’s a winning salad any time of year, but especially amazing on the beach with a dear friend that doesn’t judge when you let your kids watch a little too much TV that morning…. Try this sweet potato quinoa Moroccan salad with grilled chicken marinated in this everyday chicken marinade, or as a sweeter side to balance out the kick in these bacon mushroom chipotle turkey meatballs. 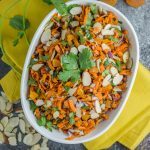 A delicious plant-based salad packed with nutrients that can be served hot or cold! Made if last night with dinner::: loved it! Has a savory and sweet combo that was great. Definitely going into the meal planning rotation. I’m glad you loved it Leslie!